TO PERFORM AT EARTH FEST 2009! 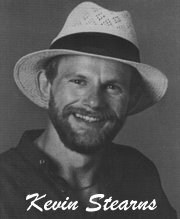 Kevin Stearns, a native of Bloomington, has entertained audiences throughout the Midwest with bands and as a soloist for over 20 years. His smooth vocal style and dynamic presentation promote audience participation in a party-like atmosphere. Whether you come to dance, sing along, or just sit back and listen, you'll enjoy Kevin's "unplugged" rendition of past and present classics from Jimmy Buffet, James Taylor, Neil Diamond, The Eagles, Paul Simon, The Beatles, Billy Joel, and favorites from the 5O's to 90's. A special treat for Earth Fest will be his "Raffi" style music hour for children. This is an extremely fun and entertaining show for the entire family!